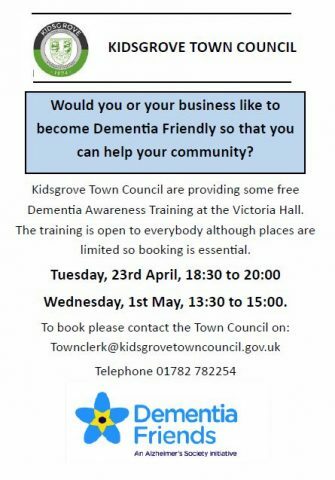 The Town Council would like to promote the Dementia Friendly initiative within Kidsgrove and its surrounds. Understanding the needs of sufferers is so important. The sessions are free and open to everybody and we will especially welcome businesses and groups who may have customers and members that would benefit from staff who can understand their needs. To learn more about being a Dementia Friend, please click here.